Looking back on Monadnock Buy Local’s accomplishments (like nurturing Plaid Friday in our region), while looking forward to what is happening in the local economy movement has me thinking -- is it time to move away from traditional nonprofits and towards different types of business models to support this work? Enter the Fourth Sector Economy. What is the Fourth Sector? There are three widely recognized sectors in our economy: for-profit businesses, nonprofit organizations and government agencies. Over time, these sectors have become blurred -- as for-profit businesses look to maximize social benefits over financial profits, and nonprofits sell products and services to diversify their revenue streams. The lines have become so blurred that many believe another sector has emerged, the Fourth Sector. 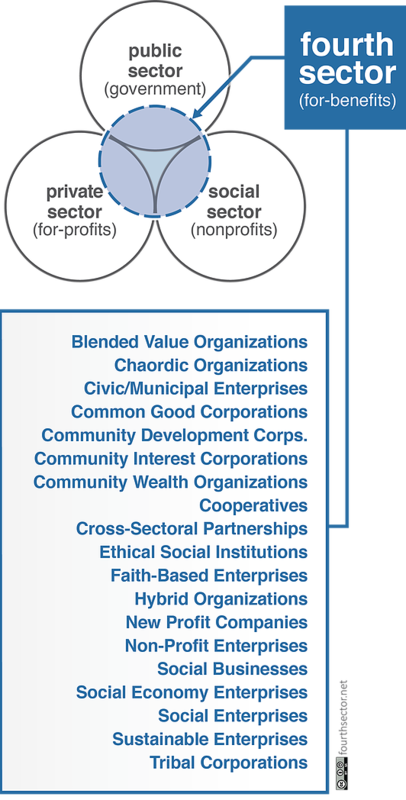 The Fourth Sector represents a merger of movements that intentionally integrate social purpose with traditional business methods. Unlike regular for-profit companies, for-benefit businesses put their mission over maximizing profits for their shareholders. The products and services that these businesses offer help them serve their purpose, not just bring in financial profits. One well-known example of a Fourth Sector business in our region is W.S. Badger Company in Gilsum, a locally owned company that makes healing balms, lip balms, sunscreens and other personal care products. In 2014, a New Hampshire law created the option for a company to incorporate as a Benefit Corporation rather than as a traditional corporation. This designation allows Badger to balance its triple-bottom line (social, environmental and financial) interests -- instead of being legally obligated to maximize financial profits for its stakeholders. Badger is also a B Corp, a certification process that helps the company “measure what matters” and better balance its purpose and profits. Other B Corps in our region include Green Energy Options and Mascoma Bank. Just like Badger, as the Fourth Sector develops, it requires a supportive ecosystem of legal structures, technical assistance and other support to meet its unique needs -- some of which is not yet developed. 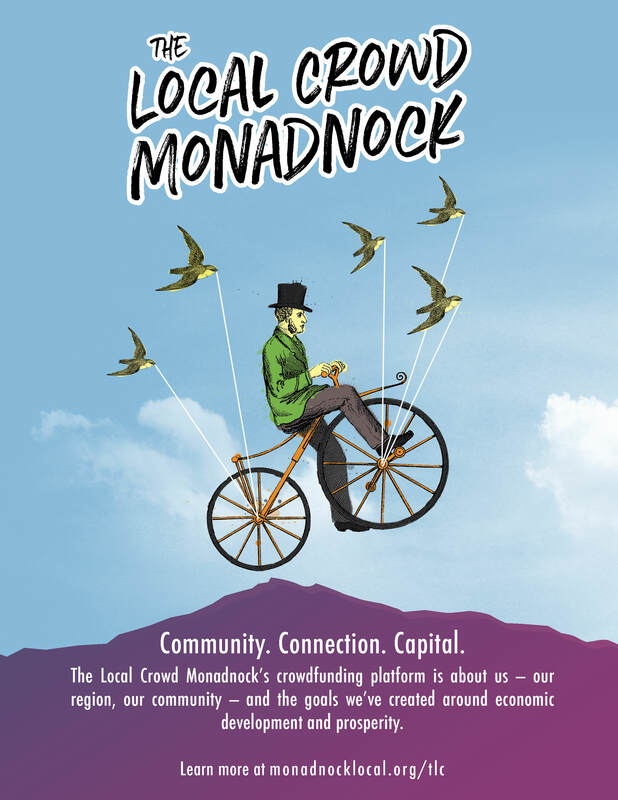 I’m thrilled to share that, first, The Local Crowd Monadnock (TLC Monadnock), a locally based crowdfunding platform, will expand to serve all towns in our region and, second, TLC Monadnock will begin working more formally to support some of the needs of the Fourth Sector Economy. Please stay tuned for more details on that work in January. TLC Monadnock is currently hosted by Monadnock Food Co-op and supported by the Greater Keene Chamber of Commerce, Greater Peterborough Chamber of Commerce, New Hampshire Small Business Development Center and Monadnock Economic Development Corporation. Discover more at monadnocklocal.org/tlc or contact me at marketing@monadnockfood.coop or 603-283-5401. 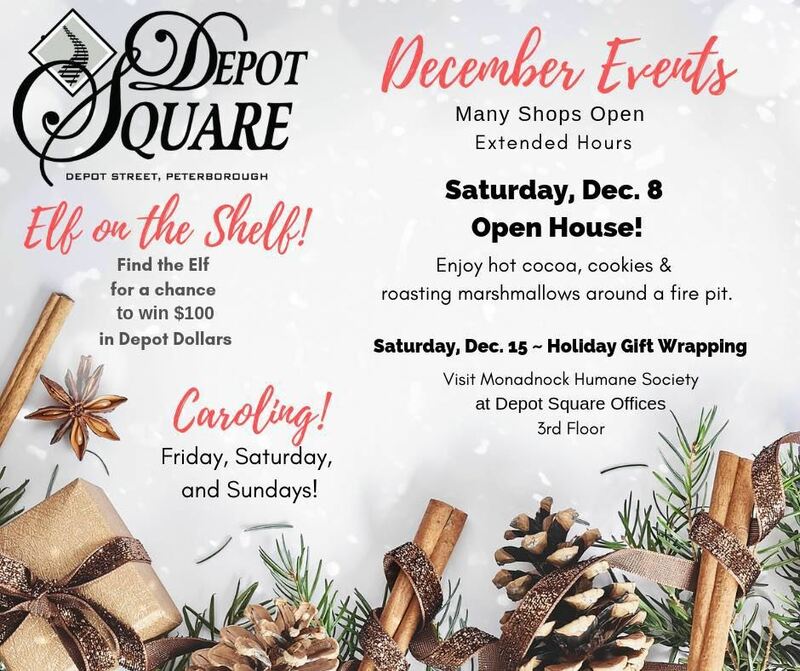 Visit Depot Square, walk around the beautifully decorated sidewalks, storefronts and sparkling lit birch trees and find that perfect gift in one of over 14 unique shops. All around the Square, we celebrate the songs of the Season with caroling groups of the Monadnock Region, from the young voices of grade schools to Senior groups to professional Choruses to the gathering of local Families. Hear the groups as they meander in and out of shops, or walk around with them, joiners are welcome! Need a break from shopping? Stop in to any of the food locations in Depot Square and regenerate! From the large selection of prepared foods at Twelve Pine, to the award winning menu at the Waterhouse Restaurant & Bar, located on the River, to the freshly baked goodies, bagel sandwiches at the Baker's Station (take home pies and Gluten Free is their specialty) -- you can find it all here. Make sure you leave time to experience the Art Galleries and find out why Expedia voted Our Town, "one of the top 10 small towns in the country for Art." Explore Fry Fine Art Gallery featuring "Mini's" from a select group of local artists, to the new exhibit at the Gallery (third floor, elevator access, next to Hobb's Jewelers) featuring the "Six Packs", 6 celebrated male artists from the Region, to Sharon Art Gallery showing the works of Edith Tuttle: Capillary Action "Yak and Snack" and Peterborough Art Academy with works by Michaela Chelminski. Make your holiday shopping easy, create memories and make visiting Depot Square a tradition for you and your family. Free parking, children welcome and pet friendly! For more information please contact Pelagia Vincent at 603-547-8323 or pelagiavincent@earthlink.net. Ready to Shift Your Shopping? From your Thanksgiving meal to your New Year’s Eve celebration, are you ready to Shift Your Shopping? From November 1st to December 31st each year, Monadnock Buy Local works extra hard to ensure your holiday spending matches the community values you support. To make our “think local first” message stronger, we participate in the Shift Your Shopping campaign. This national movement encourages citizens to support local job creation and economic growth through their holiday purchases at locally owned and independent businesses. Take the Shift Your Shopping pledge to shift at least 10% of your holiday purchases from non-local businesses to locally owned businesses. You can take the Shift Your Shopping pledge online. When you spend your dollars at locally owned retail businesses in the Monadnock region four times more money returns to our local economy compared to chain retailers. Spend a dollar at an independent business and 62 cents returns to our local economy, spend it at a chain store and only 13 cents returns. The money that returns recirculates through our economy, generating ripple effects that create new jobs, charitable contributions and community prosperity. If everyone shifted just 10% of their purchases from national chains to locally owned retailers, we would return $27 million to our regional economy annually. Ask for advice from 3,992 Monadnock Buy Local fans at our Facebook Page. Discover holiday fairs and other special events on our online calendar. Make your own gifts (whether art, food or other creation) and buy your raw materials at locally owned businesses. You may be able to buy what you need in bulk and save. To amplify your impact, buy New Hampshire made and grown gifts at locally owned businesses. Participate in the events we have planned during the Shift Your Shopping season: Plaid Friday and Cider Monday. Wear plaid on Plaid Friday to show your support for our local economy and commitment to buying local this holiday season. The day to wear plaid this year is Friday, November 23rd. 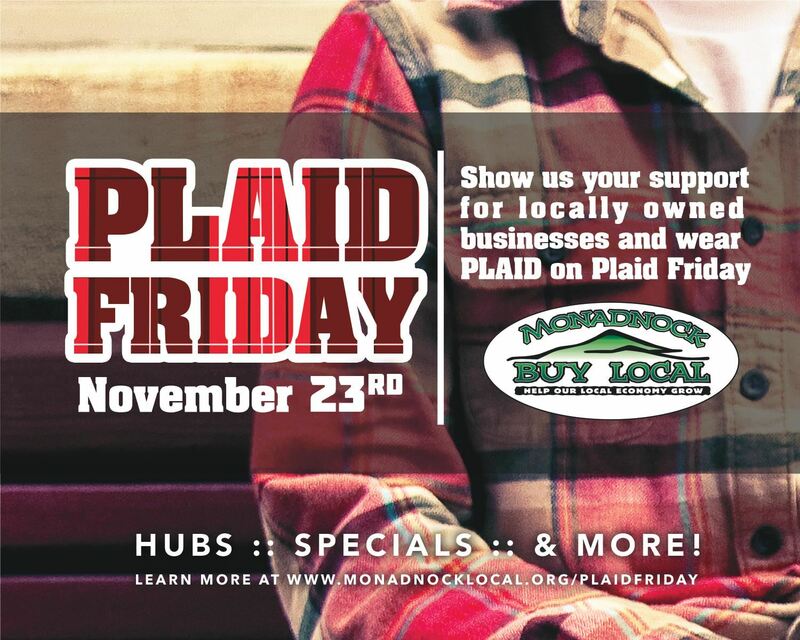 A number of Monadnock Buy Local members will serve as Plaid Friday Hubs. 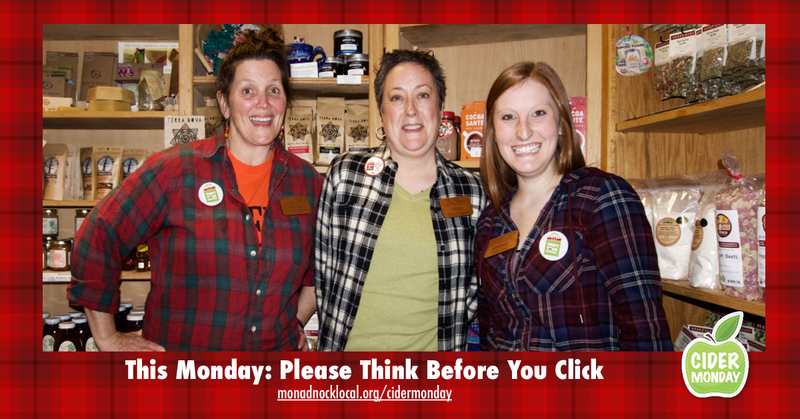 Hubs photograph customers decked out in plaid and answer questions about Plaid Friday and Monadnock Buy Local. In addition to hubs, some members will offer special events to thank you for stopping in. LuvInk&Paper in Keene will offer a Plaid Friday Holiday Card Buffet at their studio (103 Roxbury Street – Suite 306) from 9:00 a.m. to 2:00 p.m. and Joseph’s Coat in Peterborough will give 10% off any in-store merchandise to all customers wearing plaid. See more at monadnocklocal.org/specials. Wearing plaid in Keene on Plaid Friday? Hop on into the Luxury Box Photo Booth at Ted's Shoe & Sport at 115 Main Street in Keene on November 23rd from 10:00 a.m. – 1:00 p.m. We’re also very excited that Beth Pelton of Eight Cattails Imagery will set up a Plaid Friday Photo Booth from 10:00 a.m. – 3:00 p.m. at Harrisville Designs at 4 Mill Alley in Harrisville. Monadnock Buy Local will add all the photos taken to our annual collage, celebrating everyone who wore plaid to honor the day. 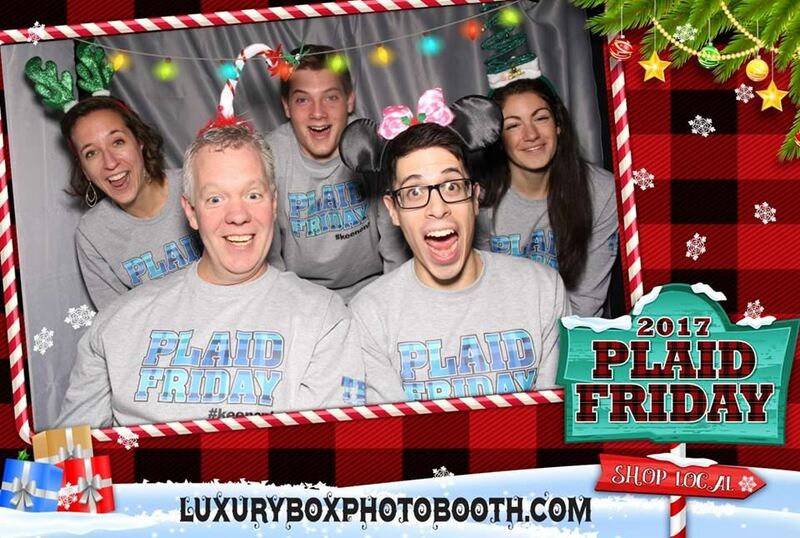 Check out our gallery of over 400 photos from past Plaid Fridays. Also, to amplify this year's event, Savings Bank of Walpole will host a Plaid Friday Launch Week from Wednesday, November 21st to Wednesday, November 28th. The bank will set up information tables at each of their branches with Plaid Friday swag to inspire more people to participate in this year's event. We encourage community members to wear plaid during launch week and stop by the bank's Marlboro Street branch to take a selfie in front of the bank's Plaid Friday backdrop. Savings Bank of Walpole will then share these photos on social media to further promote this event. That’s not a typo! Instead of Cyber Monday, a day when online merchants offer special deals, the Toadstool Bookshops invite you to a new tradition, CIDER Monday. On November 26th, stop in for a free cup of cider and browse their amazing selection of books. In response to Cyber Monday, a day when online merchants offer deep discounts to divert your attention away from buying locally, Willard Williams of the Toadstool Bookshops dreamed up this new tradition. A big THANK YOU to this year's Shift Your Shopping and Plaid Friday sponsors: Badger Balm, Brie & Vessie, Brown Computer Solutions, Cheshire Garden, The Cheshire Horse, The Dragonfly Shop, The Farm Concessions & Cafe, Flawlyss Skin, Hannah Grimes Marketplace, Harrisville Designs, Hobbs Jewelers, The Inn at East Hill Farm, Joseph’s Coat, LuvINK&Paper, Luxury Box Photo Booth, Mayfair Farm, MB Massage Studio, Monadnock Food Co-op, Nest Children’s Shop, One Stop Country Pet Supply, Savings Bank of Walpole, Steele's Stationers, Ted's Shoe & Sport, Toadstool Bookshops, VizionZ, Walpole Mountain View Winery and The Yoga Space. Please join us and Shift Your Shopping this holiday season. Together we’ll create a true holiday gift to our community -- one that will keep on giving throughout the New Year. Monadnock Buy Local's ninth annual Plaid Friday Event is set for Friday, November 23, 2018. Individuals will wear plaid on Plaid Friday to show support for the local economy and their commitment to spending more of their dollars at locally owned businesses during the holiday season. Last year, over 260 community members pledged to participate in Plaid Friday. To amplify this year's event, Savings Bank of Walpole will host a Plaid Friday Launch Week from Wednesday, November 21 to Wednesday, November 28. The bank will set up information tables at each of their branches with Plaid Friday swag to inspire more people to participate in this year's event. Community members are encouraged to wear plaid during the launch week and stop by the bank's Marlboro Street branch to take a selfie in front of the bank's Plaid Friday backdrop. Savings Bank of Walpole will then share these photos on social media to further promote this event. "With Savings Bank of Walpole (SBW) being the community's local bank, we want to show our support for our local businesses," said Danielle Ruffo, Savings Bank of Walpole's new Community Engagement Coordinator. "SBW serves many customers in our community -- and keeping your money local is what we are all about. Supporting Plaid Friday and the 'Shift Your Shopping' movement is all part of helping our local community thrive and grow." Plaid Friday celebrates the diversity and creativity of local and independent businesses. It's a fun and festive alternative to the "Black Friday" consumer frenzy perpetuated by big box stores. It's also a great way for the community to show its support for Monadnock Buy Local -- a network of locally owned businesses, organizations and individuals working to build a stronger local, green and fair economy. This event originated in Oakland, CA with the intent to bring back the times when shopping for friends and family was a pleasurable and leisurely activity. "All in all, Plaid Friday is gaining momentum. It's safe to say that 80-90% of people who stopped in [during last year's Plaid Friday] were wearing plaid," said Ted McGreer, owner of Ted's Shoe & Sport. "Shopping, not asking for deals, just happy to support a local shop... That felt great." A growing list of locally owned businesses will serve as Plaid Friday Hubs, photographing customers decked out in plaid and answering questions about this event. View our list of Plaid Friday Hubs. 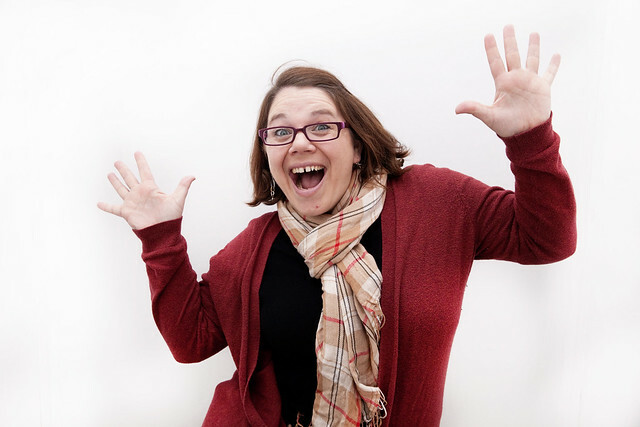 Local photographer Beth Pelton from Eight Cattail Imagery will host a Plaid Friday Photo Booth inside Harrisville Designs, located at 4 Mill Alley in Harrisville, from 10:00 a.m. to 3:00 p.m. 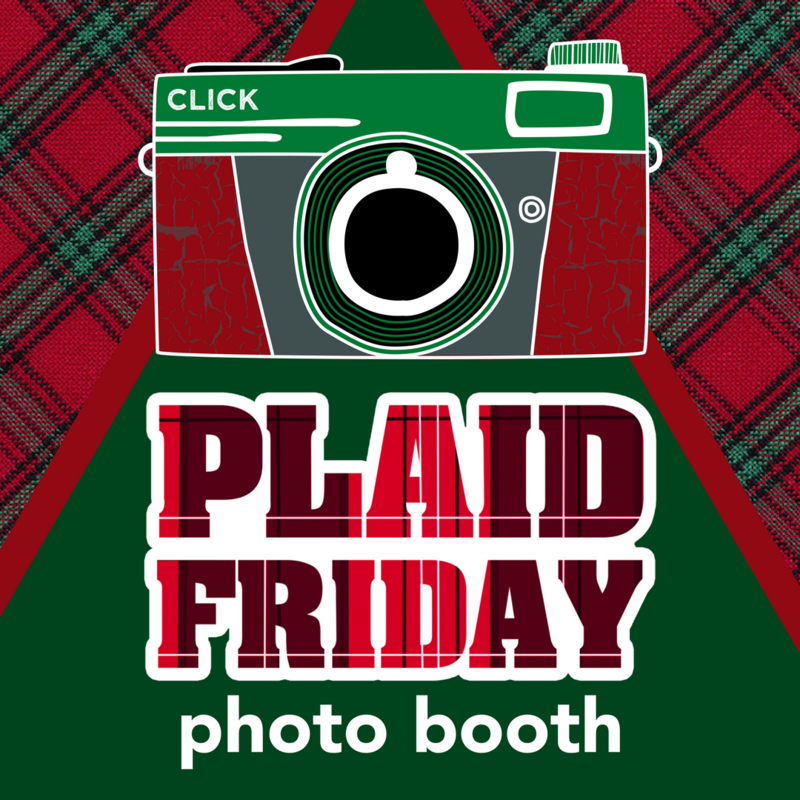 In Keene, Ted's Shoe & Sport at 115 Main Street will host a Plaid Friday Photo Booth inside the store with Luxury Box Photo Booth, from 11:00 a.m. to 2:00 p.m. Monadnock Buy Local will add all of the photos taken to their annual collage, celebrating all who wore plaid: bit.ly/MBLplaidfriday. A number of Monadnock Buy Local members will offer specials to honor the day and thank community members for their support. LuvInk&Paper in Keene will offer a Plaid Friday Holiday Card Buffet at their 103 Roxbury Street - Suite 306 studio from 9:00 a.m. to 2:00 p.m. and Joseph's Coat in Peterborough will give 10% off any in-store merchandise to all customers wearing plaid. Stay tuned for more specials and events. Plaid Friday is part of the "Shift Your Shopping" movement in the Monadnock region. From November 1 to December 31, Monadnock Buy Local encourages residents to choose local and independent businesses for more of their holiday purchases. The Monadnock Region's Plaid Friday event is sponsored by Badger Balm, Brie & Vessie, Brown Computer Solutions, Cheshire Garden, The Cheshire Horse, The Dragonfly Shop, The Farm Concessions & Cafe, Flawlyss Skin, Hannah Grimes Marketplace, Harrisville Designs, Hobbs Jewelers, The Inn at East Hill Farm, Joseph's Coat, LuvINK&Paper, Luxury Box Photo Booth, Mayfair Farm, MB Massage Studio, Monadnock Food Co-op, Nest - Children's Shop, One Stop Country Pet Supply, Savings Bank of Walpole, Steele's Stationers, Ted's Shoe & Sport, Toadstool Bookshops, VizionZ, Walpole Mountain View Winery and The Yoga Space. On the patio of Twelve Pine, enjoy Live Outdoor Music by Folksoul Band, 5 piece combining horns, vocals, drums with the sound in the tradition of Mardi Gras and New Orleans, playing popular Jazz and Rock'n'roll. The music starts at 11am to 3pm. Find a spot on the hay bales to stay a while and maybe even dance! From 10am to 4pm, view 6 female regional artists at The Gallery (third floor, elevator access) at the Offices at Depot Square, their perceptions and visuals of the subjects that inspire them. From horses to abstract to ocean scenes there is something for everyone. Meet the artists, Rose Lowry, Johniene Papandreas, Hillary Blackman, Mary Vecchio, Dorothy Palanza. Complimentary refreshments provided. At 11am the Toadstool Bookshop presents Robert Hunter accomplished author, entertainer and musician from Nashville, who will discuss and sign his new book and give a live acoustic performance. Seating is limited, please come early! Visit the Peterborough Art Academy for Pumpkin Painting! All day set up with Everything you will need, all are welcome to be creative. Additionally, meander next door at Tribals, Rugs by Hand, where you will find a huge array of rugs. Enjoy a One Day sale of 15% on all rugs! Fry Fine Art Gallery, is featuring Artist Daryl D. Johnson, newest works, The Chi of Clouds are on exhibit in the Pelletier Gallery. Also showing, THE MUSE, featuring a collection of an intimate vision of the female form. Soft Opening for new retail shop, PETborough! Meet the owner, Dara Forleo and check out the great items for all the pets in your family. Located next to Hobbs Jewelers. Pets welcome! Ample free parking all around Depot Square. Music, leaf viewing and events are complimentary and Open to the Public. All are Welcome! For more information, please contact Pelagia Vincent at pelagiavincent@earthlink.net or 603-547-8323. We’re ramping up for this year’s Shift Your Shopping, Plaid Friday and Cider Monday efforts with a Monadnock Buy Local Citizen Membership Drive. The more citizen members we recruit, the more our Shift Your Shopping efforts will grow! For $25, you’ll become a Monadnock Buy Local Citizen Member and also receive Merit Points on our new Monadnock Placemaker program (save up merits to purchase rewards from participating businesses). Become a Citizen Member today! The public is invited to explore Cultural Cocoon, a new store at 32 Main Street, Peterborough, New Hampshire. The store is open Thursday through Saturday from 11 AM to 5 PM & Sunday from 11 AM to 4 PM each week. Cultural Cocoon’s mission is to encourage economic development in the region and in Peterborough by offering opportunities to purchase rare and beautifully made items handcrafted by some of the most highly skilled artisans in the world. The store will offer beads, home décor and unique collectibles, many of which are created in limited editions. Offerings will change, so you are invited to visit often. Joseph’s Coat, Mariposa Museum and Cultural Survival Bazaar collaborated to bring artisans and their creations to a world craft market at Mariposa Museum & World Culture Center in July. Building on that success, the partners devised a plan to provide a space for artisans to show and sell their creations year-round, complementing their efforts to sell at local bazaars. A new nonprofit store, Cultural Cocoon, resulted. Cultural Cocoon and Mariposa Museum each have their own space in Peterborough’s historic Carr building. They share a passion for building cultural understanding through education and stimulating the appreciation and purchase of handcrafted items. 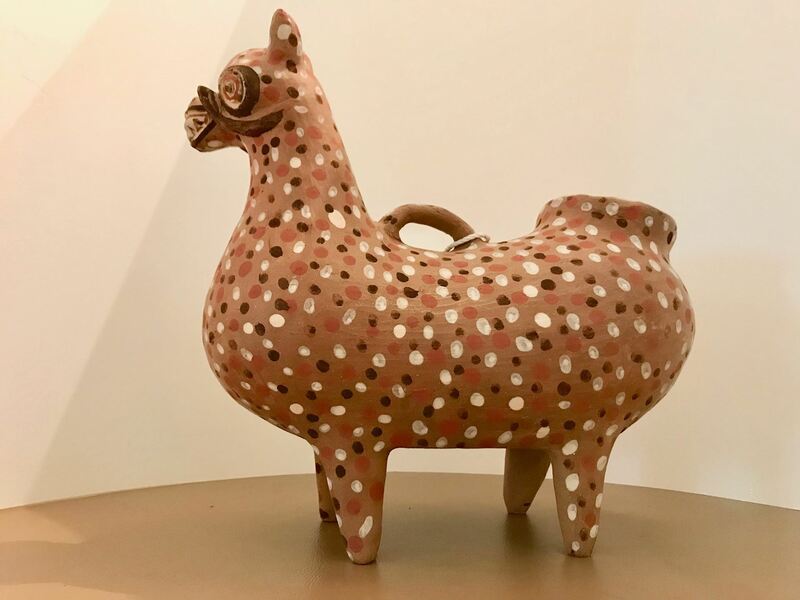 Some of these items are created using processes that are centuries old, and buying them is one way to help preserve these arts. Françoise Bourdon, a shopper at Joseph’s Coat since it opened in 1980, its owner since 2006, will manage the new store. Cultural Cocoon’s environment is relaxed, inviting guests to linger, browse and enjoy a slower shopping pace. It’s another great place in Peterborough to enjoy a true multicultural experience. To learn more, contact Bourdon at 603-784-5585. About Joseph’s Coat: Joseph’s Coat is “one of the coolest shops in the Monadnock Region,” selling an ever-changing inventory of handmade creations that particularly attract those who love textiles. Learn more at www.jocoat.com. About Mariposa Museum & World Culture Center: A museum of world cultures, Mariposa Museum is a hands-on museum designed for all ages, offering educational programs, field trips, and tailored workshops. Learn more at www.mariposamuseum.org. About the Cultural Survival Bazaar: Cultural Survival Bazaars are a series of cultural festivals that provide indigenous artists, cooperatives, and their representatives from around the world the chance to sell their work directly to shoppers in our country. Learn more at www.bazaar.culturalsurvival.org. Archway Farm will host Dan Profitt of Butcher Pete’s Mobile Meat on October 13, 2018 from 10am to 2pm. Dan will demonstrate how to break down a whole hog from snout to tail and covering practical home uses for every part of the animal. Each student will go home knowing the basics of knife handling, sharpening, jointing and breaking, and converting a whole animal into retail cuts. And they will also take home a heck of a lot of pork too! The course is for anyone over 18 and knives will be provided. You will be going home with no less than ten pounds of fresh pork as well, so bring a cooler and a couple ice packs. Dan has over 18 years of experience in butchery, starting at Paul’s Choice in Keene as a teenager. He went on to manage several meat and seafood departments for Whole Foods Market. This year he founded Butcher Pete’s, a mobile butcher service for farmers and hunters. “We are excited to be partnering with Dan on this class as it combines two of our passions, raising pigs outdoors on pasture and connecting people to their food,” said Mark Florenz, owner of Archway Farm. To register for this class, contact Mark at archwayfarm@gmail.com or 603-352-3198. To learn more about Archway Farm visit archway.farm. Also, find Archway Farm on Facebook and Instagram. Last year, Monadnock Buy Local’s Shift Your Shopping Promotion (including our signature Plaid Friday Event) went statewide. With your support we can continue to build traction -- inspiring more and more community participation and media attention. "All in all, Plaid Friday is gaining momentum. It's safe to say that 80-90% of people who stopped in on Friday were wearing plaid! Shopping, not asking for deals, just happy to support a local shop... That felt great." Your sponsorship of our 2018 Shift Your Shopping Season will help us better promote the importance of supporting locally owned businesses, inspire more of us to shift our holiday spending to independent businesses and show our region your dedication to the local economy movement. 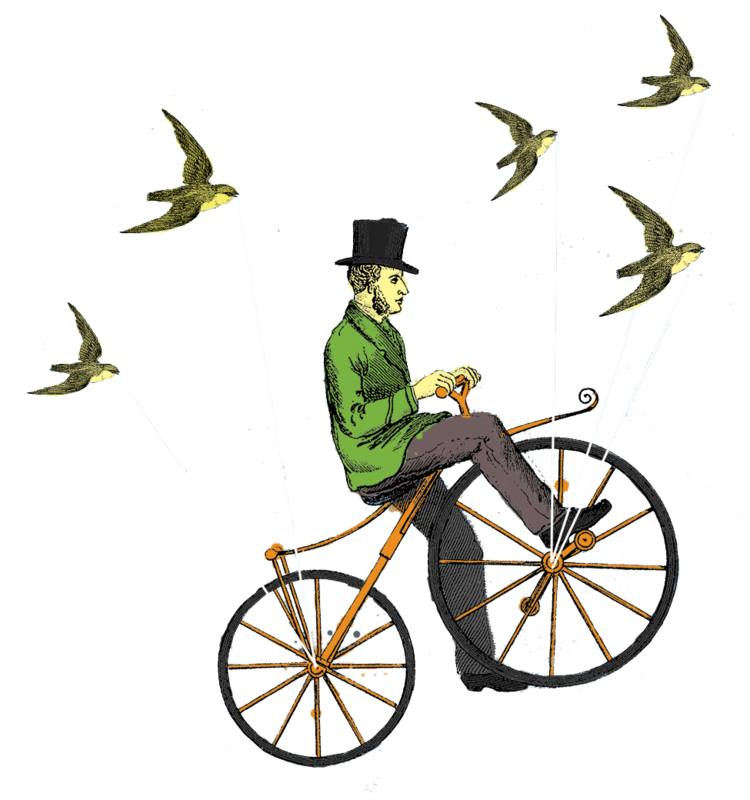 Please consider sponsoring this year’s Shift Your Shopping Promotion at one (or more!) of the levels below. Not yet a Monadnock Buy Local member? Contact us to make that happen (most sponsorship levels are limited to members). Some sponsorship slots are limited, so please pledge your sponsorship soon. All sponsorship pledges are due before September 21, 2018. Please contact us at monadnockbulocal@gmail.com if you have any questions and thank you for all you do to support our local economy each and every day! For the sixth year, Monadnock Buy Local celebrates local food, farms and our entire Monadnock region food system during New Hampshire Eat Local Month. Our food system includes all the pieces needed to bring local food from the farm to our plates: the soil, farm workers, transportation networks, markets and more -- everything needed to grow, harvest and distribute these goods to us. These pieces come together to form our local food system. Now let’s dig in and discover what’s new in our Monadnock region food system this year. Kin Schilling, founder of the Cornucopia Project, and beekeeper Melissa Stephenson teamed up to form the NH Honey Bee Initiative to protect honeybees and other pollinators -- animals critical to the health of our food system. Their first project raised over $16,000 through The Local Crowd Monadnock to bring artist Matthew Willey from The Good of the Hive to the Monadnock region. The Good of the Hive is a global effort to raise awareness around the plight of pollinators. Matthew’s goal includes hand-painting 50,000 individual honey bees on murals and installations around the world. He spent August painting a mural of honeybees on an exterior wall of the Peterborough Community Center. Be sure to check it out! The Monadnock Sustainability Network (MSN) partnered with the Cheshire County Conservation District to develop the Community Supported Solar for Farmers project. Based off the same Community Supported Solar model that brought solar panels to the Monadnock Food Co-op in Keene, this effort will focus on bringing renewable energy to farms. “Our community proudly supports local farms in our region -- but buying local isn't always enough as farmers face substantial operating costs and tough competition from more conventional and larger farms from afar,” said Amanda Littleton, MSN Board Member. Transitioning to solar energy will help farmers stabilize and lower a significant operating cost while decreasing their carbon footprint. To kick-start this effort, MSN recently launched a crowdfunding campaign on TLC Monadnock. As of today, they have secured 30% of their crowdfunding goal. Support this campaign at http://c-fund.us/glx. Food Connects and its New Hampshire-based food hub Monadnock Menus deliver food from over 65 farms and local producers to 100 wholesale customers in the Keene and Brattleboro areas. In 2018, Food Connects raised over $250,000 to scale up operations by adding new delivery vehicles, cold and frozen storage facilities and more staff. This year, Monadnock Farm and Community Coalition (MFCC) launched its new website, mfcommunitycoalition.org, to better promote local food and farm resources. Also, thanks to feedback from local farmers, MFCC will offer two quarterly forums on farm marketing and scaling up farm businesses. Save the date for their annual Feast on This! Film Festival, November 8 – 10. Jess Gerrior, Doctoral Fellow in the Environmental Studies Program at Antioch University New England and Director of the C&S Workplace Organic Gardens Project, carried out a service learning project for MFCC this year. She created a digital resource called Cultivating Community to document the people working on our regional food system with photographs and narratives. Community Garden Connections (CGC) builds local capacity to grow food and ultimately our region’s food security. It focuses on food’s connection to community health and resiliency. With the support of Antioch University of New England and community partners, CGC supports thirteen community garden sites at social service organizations throughout the region. This year, their Westmoreland Garden site added a high-tunnel greenhouse, strengthening their capacity to grow food for charitable organizations like the Community Kitchen in Keene. For the second year, the Monadnock Food Co-op’s Farm Fund awarded grants to local farms. This year’s awards went to support winter crop storage at Picadilly Farm in Winchester, production efficiencies at Echo Farm Puddings in Hinsdale, marketing efforts at Brookfield Farm in Walpole and planting efficiencies at Tracie’s Community Farm in Fitzwilliam. The Farm Fund, a partnership between the co-op and the Cheshire County Conservation District, seeks to increase sustainable food production and wholesale sales to contribute to a thriving local farm economy. Thank you to all the individuals, programs, policies and initiatives that continue to build stronger local and regional food systems in our corner of the state and throughout New England. Together, we’re cultivating healthier citizens, communities and economies.